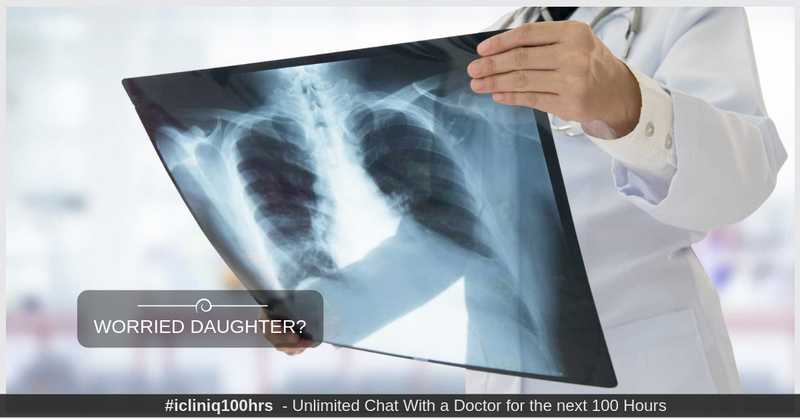 A worried daughter of a 68 year old patient contacted a radiologist on icliniq.com regarding the interpretation of chest CT scans of her mother, who coughed up blood a week back. Her mother’s X-ray showed a lung nodule of 2.3 cm, so a chest CT was ordered after two months. The CT scan reports showed scar tissue in the upper and 4 mm nodule in the lower side of the left lung. The daughter was concerned about a hazy region behind the nodule, and she was also worried about it being malignant. After going through the CT scans thoroughly, the doctor agreed that the hazy margin could be due to the healing of the tissue or some residual active infection. And he also suggested that as the patient is on blood thinners, the cause of the blood in cough could be due to some mucosal injury in the respiratory tract due to persistent coughing. And finally, regarding the concern about the nodule being malignant, the doctor reassured her that 4 mm mass is too small to be cancer. Following this conversation, the daughter was relieved and was very happy with the prompt and experienced answers from the doctor.